Family adventure travel - an exciting alternative to the lake activities. Summer at Lake Winnipesaukee will never be the same. It’s no longer just boat rides, beaches and boardwalks in the lakes region. Awfully big adventure travel vacations have become the latest craze and New Hampshire isn’t sitting idly by. You can test out your fitness level and challenge yourself to the adventures waiting nearby. For those adventure seekers, you have choices now. The Lake Winnipesaukee area of New Hampshire has added several new adventure games to the mix. 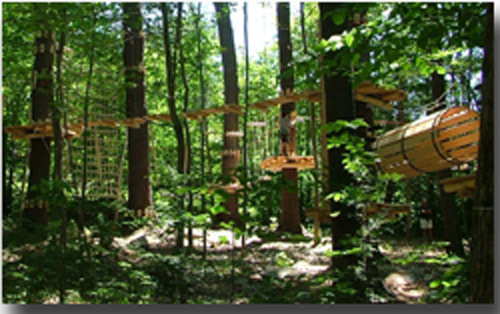 Each of the places have a ropes course and adventure games to fit different levels of fitness. Try one or try them all. I'm sure you'll have fun. Gunstock has always been known for their winter activities of downhill and cross-country skiing. Now, the Gunstock Mountain Adventure Park is open and the summer season includes three new adventure attractions. 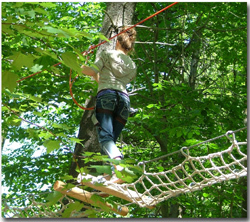 First, there’s the aerial treetop adventure course which is a challenging ropes course through the trees. You will be challenged by climbing ropes, ladders, surfboards, nets, zip lines and many more obstacles. There are courses for all levels and can be quite difficult towards the end. Second, is the new Mountain Segway tours. This is cool. You get to ride over alpine and cross country trails on a Segway while enjoying a nature and historical tour. Third, is the ZipTour with eight different zip lines that are 155 feet off the ground. The ZipTour has the longest zip lines in the continental U.S traveling 3900 feet at speeds of up to 56 mph. Funspot has always been the spot for fun in Weirs Beach. There are arcades, kiddie rides, bingo, bowling, mini-golf and now you can try new adventure games at the Monkey Trunks high ropes and zipline park. This is the newest and the largest Monkey Trunks in northern New England. The other two parks are located in Chocorua and Saco, Maine. This ropes course is fun and exciting. It is also designed to be safe for everyone of all ages. But, it does have a weight limit of 250lbs. The Daytona Fun Park is known for their go-kart track, bumper boats, mini-golf and other fun activities. New to them this year, is the Skytrail Adventure Ropes Course. This course is geared towards kids wanting to do this on their own, families and groups. Instead of requiring training before attempting the course, the participants are locked into a safe harness system. This adventure time course has 18 different games and people can go as slow or as fast as they want. The Skytrail ropes course is something the whole family can enjoy together and its very affordable.